Residential, community and commercial gates can be secured in a variety of ways. Which is best depends on the type of gate you have, what you are trying to achieve by locking the gate and your budget. Your options to lock a gate are padlocks, standard door locks, keyless locks and keyed special gate locks. 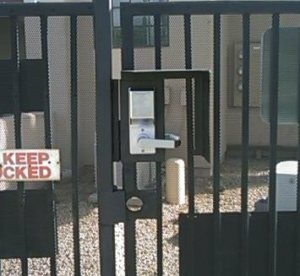 How Much Does it Cost to Install a Gate Lock? Have you been using a padlock to secure your gates? Though it is the most common way to lock an outdoor gate, it’s also one of the least secure. Padlocks, if not bought carefully, can easily be cut or pried off – as can the chain or hasp that is holding them. It’s can also very frustrating that, just when you need to get it, you can’t find the key! Outdoor gates can be secured using several alternate methods. Padlocks, keyed latches, deadbolts, levers, chain, and keyless locks can all be used. So what are the considerations when choosing how to lock your outdoor gate? First, the gate is outside. Whatever lock is put on needs to be weather resistant. 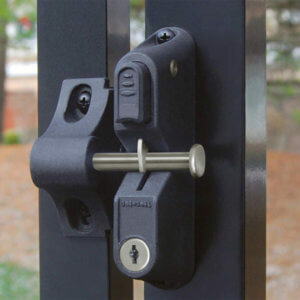 We know of several home owners that installed home electronic door locks on their outdoor gate. That’s a big no no. 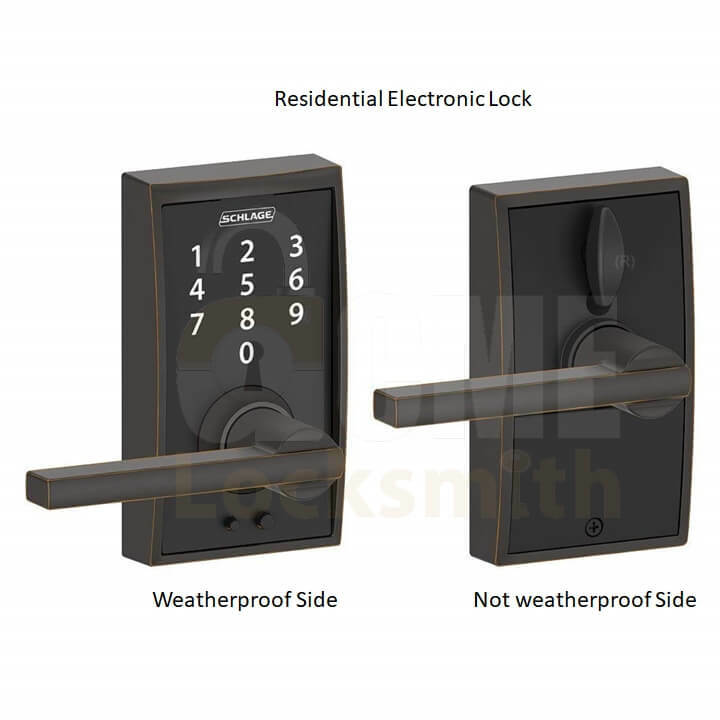 Only one side of a residential electronic lock is weather resistant. The part of the lock that is normally inside the home, is not. Putting these locks on gate results in a quick failure of the lock. Second is the configuration of the gate, especially if the gate is old or a chain link fence. All gate locking solutions that we are discussing require that the swing-side of the gate be close to the stationary post of the gate. Any locking mechanism need to cross this open gap for the gate to be able to secure. 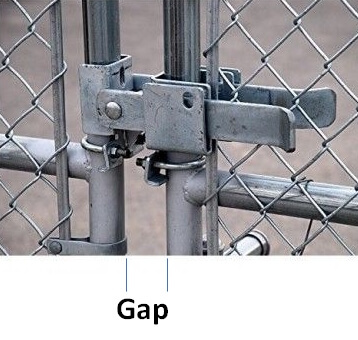 On many old gates, the gap is too wide and major modification will be needed when it is. Depending on the gate, this distance will likely need to be less than one inch. For gates with steel square tubing where a gate box will be installed, a locksmith can close the distance when welding in the gate box. The measurement of this gap should always be taken into consideration when shopping for a solution. Third, does a gate box need to be installed? Some of the available products for locking gates do not require a gate box to be installed. A gate box is a box that is welded or otherwise secured to the gate. The box is specifically milled to properly secure the type of lock you are installing. 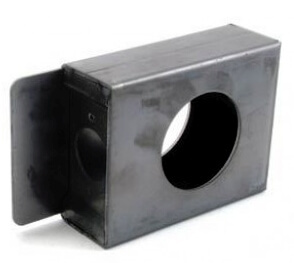 Some gate boxes also contain an extra piece of metal (see image) that piece acts as the stop so the gate will stop in it’s proper position when swinging closed. You will need a gate box if you plan on using a standard piece of door hardware (deadbolt, doorknob or lever) or a commercial-grade keyless gate lock\. You will not need a gate box if you are using a keyed latch, hasp or a good durable chain with padlock. Most local locksmiths carry the welder needed to weld to steel and can install the gate box and lock to the gate for you. Lastly, do you need a gate closer? When modifying your gate, you most likely will want the gate to close automatically so that when it latches the gate will be locked. If the gate does not have a current gate closer, a kant-slam gate closer, springs or a pneumatic gate closer will need to be purchased and installed. Gate closer pricing varies wildly depending on what you want to purchase, you can find the prices of almost all options on Amazon here. Again, your local locksmith can assist with this installation. If the gate already closes on its own, you are all set. If You Need to Use a Padlock and Chain, Use a Good One. Chain link fences can be the most difficult to add after market locks to. A standard steel welder cannot weld to the galvanized metal used in chain link fences and your local locksmith will most likely only have a standard welder. So that eliminates the possibility to install a gate box and thus eliminates a number of options you might of otherwise had. For this reason, if the gate was not fabricated with another lock in mind, most people just use a a padlock to secure the locking hinge in place with a chain or a hasp specifically designed to use on chain link gates. If this is the only method available to you use a secure padlock and chain. Check out our recommended padlock and chain from our blog post. Lockey came out with an excellent product to secure a chain link fence, the GB2900, but there are a few considerations. The gap between the rail and the post must be tight. Usually 1/4″ – 1/2″ before installation. Otherwise the latch will not catch and lock the gate. Additionally the fence rail must be 1 5/8″ or 1 7/8″ to secure the box. No welding is required to install this gate box. 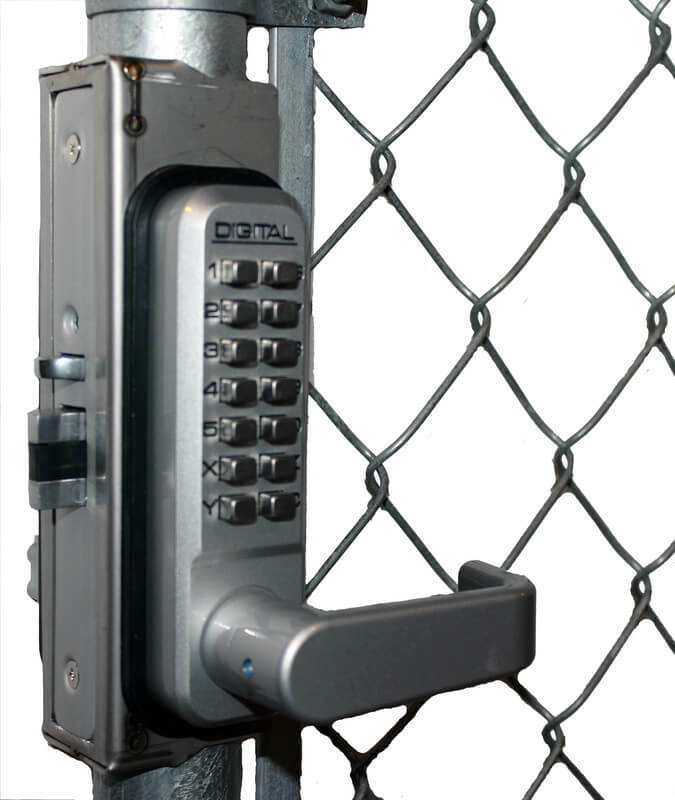 Considering the very limited options for an easy to open keyless chain link gate lock, this is a great solution. I found a good price for it when writing this blog on Amazon. If you do need the chain link gate box, in order to get the self latching feature when the gate is closed you need to get the Lockey 2985. it also has a good price on Amazon. If you’re in the Phoenix area, we have a ton of experience installing these locks. If you’re not in Arizona, just contact your local locksmith if you need assistance. 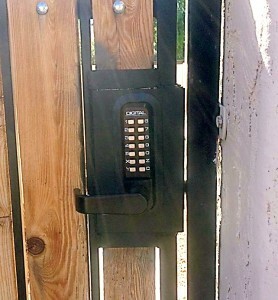 Once you’ve determined that your gate can support a lock box you now have the option of installing keyed locks (like deadbolts, door knobs, and levers) or keyless locks (such a those that use mechanical pin codes or electronic pin codes / fobs). What are the trade offs? Keyed locks have one big advantage: price. Especially if you can use the Keyed Latch shown. These locks are easy to install and a great price on Amazon. The brand I carry use the Kwikset keyway. So if your home locks are Kwikset, this can easily be keyed up to the same house key. Just take it to your local locksmith before installing and they will take care of keying it for you. If you can’t use the keyed latch, you can use normal residential door hardware but the gate will need to be modified. Even with the modification, it will be considerably less to use keyed hardware rather than keyless because not only is keyed hardware less expensive but the keyless hardware will require the same type of gate modification to support it. Without that right planning, keyed gate locks will suffer from the same problem as padlocked gates – keeping track of that extra key. Nothing is more annoying than realizing you need to open the gate only to discover you can’t find the key! To minimize this problem with keyed gates, make sure that the keyway of the keyed lock you are planning to install matches the same keyway as your house key. Thus, eliminating the need for an extra key. If having an extra key does not bother you, keyed gate locks are a very affordable and easy solutions. We love keyless locks for gates. They have two main advantages: convenience and flexibility. For convenience there are no keys to keep track of so you’ll never be searching for the key. For flexibility the codes can usually be changed by the owner. So if that lawn care crew you were using doesn’t work out, you can simply change the code so that they no longer have access to your back yard, giving you the best security. But cost can often be the issue, especially when the gate was not configured to support these locks. Gate modification will be required and there is the cost of the gate lock itself. Mechanical gate locks are less expensive than their electronic counter parts. However, it can be difficult to change the code because the locks must be taken apart and a series of wafer pins rearranged. If it is too much, your local locksmith will certainly be able to help. Mechanical gate locks only allow one code, but this is sufficient in most applications. Our favorite mechanical gate locks are from Lockey. The offer a lifetime mechanical warranty and can be found on Amazon. They are a great value and a great gate lock. 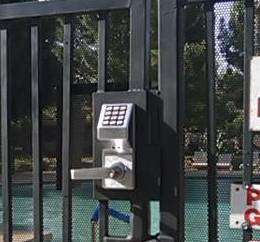 Offer all the advantages of the mechanical keyless gate locks with the additional advantages of supporting more than one code (good for community gates where tracking access is desired) and the codes are easier to changed than the mechanical locks. But, they are the most expensive locks available. Check out our overview of keyless gate locks to see if these locks are for you. Welding. A portion of the gate will need to be cut out to support the gate box. The gate box will need to be welded into place. Reach Around. Depending on the height of the gate and the gates current construction, you may need to prevent someone that wants to get in from simply reaching through or over the gate in order to open the lock from the lever inside. Reaching through is often prevented by welding on a piece of steel mesh over the slots in the gate. Reaching over is prevented by either heightening the gate or welding an additional piece of metal around the lever. The image shows the inside side of an keyless gate lock installed. Both the mesh and a protective shield have been used, though it’s difficult to see the mesh. You can also choose a lock that has a key on the inside or a keypad on the inside so that someone can’t reach over/through the gate. Depending on the gate, this may be a fire code violation so always check with your local fire department before preventing free egress. Gate Closer. If they gate does not currently close on its own, a closer will need to be installed if you want the gate to self close and automatically lock. How Much Does it Cost to Add a Gate Lock? A lot of the cost will depend on the lock itself and the gate modification you want done. In order of expense with our recommended products. Keyed Gate Latches: can be had for around $50 (see it on Amazon). If you need a local locksmith to install add $100 for the service call and labor. Padlock and Chain: Our favorite padlocks and chain will secure that gate of under $100. Gate Modification: Cutting and welding in a gate box varies a little depending on the gate box needed and the existing configuration of the gate. For gates that do not need any reach around protection you will be in the neighborhood of $200-$250. Add $100-$150 more for reach around protection. These prices do not include the parts. Gate Modification Self Closer: If the gate needs an additional closer, welding and part will run approximately $100-$250 depending on what type of closer is used. This does not include the part. Locks: Standard key locks are priced just like house door hardware and are in the neighborhood of $50 per piece. A good mechanical lock will be about $200 (see on Amazon) and a good heavy duty commercial grade electronic lock $350 on up (see on Amazon). Disclosure: As an eBay / Amazon Associate I may earn from qualifying purchases.